Dr. Richard Arno, the founder of the National Christian Counselors Association (NCCA), spent many years in the development of the Arno Profile System (APS) Report. The APS Report provides a detailed analysis of a person's inborn temperament. There are three inborn temperament areas called the Inclusion (social/intellect) Area, the Control Area, and Affection Area. 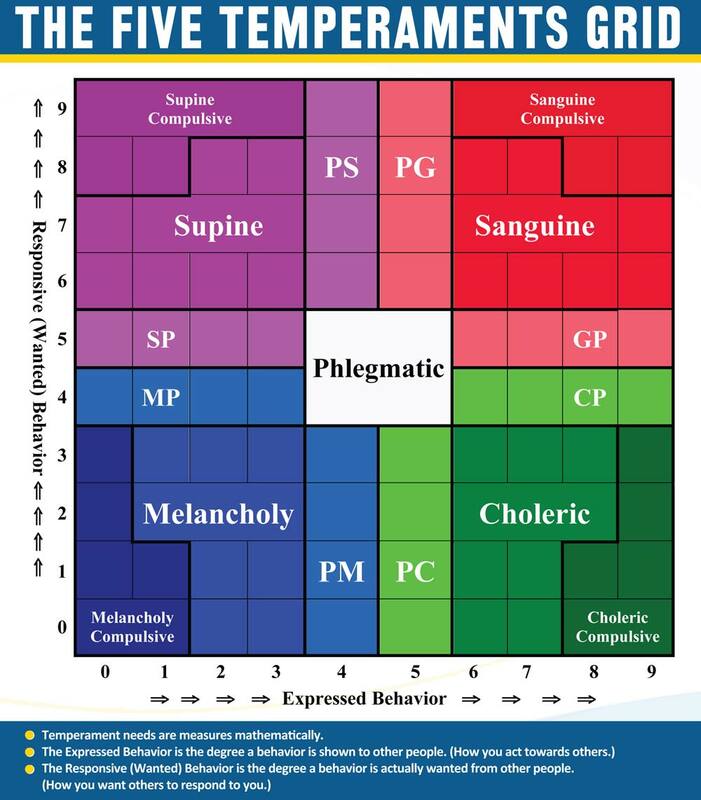 These three areas have classification temperament types called choleric, phlegmatic, melancholy, sanguine, or supine. The temperament may also be a blend of these five temperament types such as a person being a "phlegmatic melancholy" in the Inclusion Area or a "supine melancholy" in the Control Area or a "sanguine choleric" in the Affection Area. Each person will have a unique temperament trait within each of the three temperament areas. It is extremely rare to find two people with identical temperaments, and it is doubtful if any two temperaments are totally identical. The APS Report provides recommendations on how to compensate for weaknesses in the three temperament areas, and how to capitalize on strengths in the three temperament areas. Your temperament is like a fingerprint; i.e. it is totally unique. We use the APS Report in all phases of coaching and counseling. It is an 8 to 9-page report and is computer generated by software from the answers given to 54 questions by each client. The questionnaire is completed as well as the intake forms to generate the on-line APS through NCCA which assists the founder in developing a strategic "Client Plan." The "Client Plan" is a road map followed by the founder to obtain optimal satisfaction and happiness in the client's life for your unique temperament. Some temperaments find greater levels of happiness and satisfaction than others. Some temperaments are not conducive to assistance or counseling at all, and may need a little encouragement or inducements as to the available happy lifestyle with certain clinical therapeutic changes. Some people will have temperaments that are very dark and are plagued with difficulties . . . causing great difficulty for the person to navigate life's "ups and downs." Even if they totally capitalize on the three temperament areas' strengths in dealing with their weaknesses, they still may find life extremely depressing at times requiring special therapy from counselors, psychologists, psychiatrists, and others and resultant use of SSRIs (Selective Serotonin Reuptake Inhibitors), antidepressants, and/or mood elevators. With all this, many people are still driven to suicide and/or attempted suicides and/or insanity, each year, because they simply cannot cope with life's fast pace, high stress, and turmoil they experience with their God-given, inborn temperaments. You will be asked to carefully study the APS report. Its contents will never be discussed outside of counseling sessions unless a client agrees that this may be done. A copy of the report goes into your file and is confidential. The founder is governed by a strict code of ethics of the profession to never release any information in your files unless required by law; e.g., in cases where child or elder abuse becomes known in counseling sessions and a person's life may be in danger. The purpose of the APS Report is to help you better understand yourself. Married couples and parents find this report very useful. Married couples and parents need to know "who the person is that is sleeping in their bed." They also need to know “who is living in their house." How can a person expect to understand their husband, wife, son, daughter, brother, or sister if the needs, tendencies, and traits of these "significant others" are not known or well understood? The APS Report analyzes: 1) your “Inclusion Area,” which is your social orientation and intellectual energy; 2) your “Control Area,” which is your willingness to make decisions and to accept responsibility for yourself and others; and 3) your “Affection Area,” which is the need you have to express and receive love and approval, as well as your need for deep, personal relationships. The cost of the APS Report is $60 for one or $110 for a couple. Schedule your APS Temperament Report!